It is not a secret that many people today have sleeping problems, so it is no wonder that scientists invented special headphones for sleeping. In our article, we will try to offer you 7 models that we consider the best noise cancelling headphones for sleeping in 2019. In addition, we will try to explain to you how these headphones can help people with sleeping problems. We will also try to emphasize the most common problems as well as benefits that come with sleeping with headphones and suggest what to pay attention to when buying products like these. How Can Sleeping Headphones Help You Solve Sleeping Disorder? Sleeping disorder doesn’t have to refer only to insomnia. There are so many types of sleeping problems caused by so many different reasons. We are all unique and every one of us has his/her preferences about every single thing in life and sleeping habits aren’t an exception. Some of us like to sleep on our back, others like to sleep on a side or on their stomach. Some of us like sleeping in a perfectly silent room and others can sleep no matter what is going on around them. Also, if your partner snores loudly or you live in a noisy neighborhood and you can’t fall asleep if you hear barking, fighting, yelling and other disturbing sounds, you should find a way to solve the problem. However, we can’t always affect other people; we can’t shut up or wake up our partners because they are not snoring on purpose nor we can order all the people and animals on the street to be quiet. One thing we can do is to find some device that can ease our pain and help us get some quality sleep so we can function normally. There are numerous devices that different companies offer for solving sleeping problems. We can’t even say that some of them aren’t good enough because every one of us finds different things helpful. 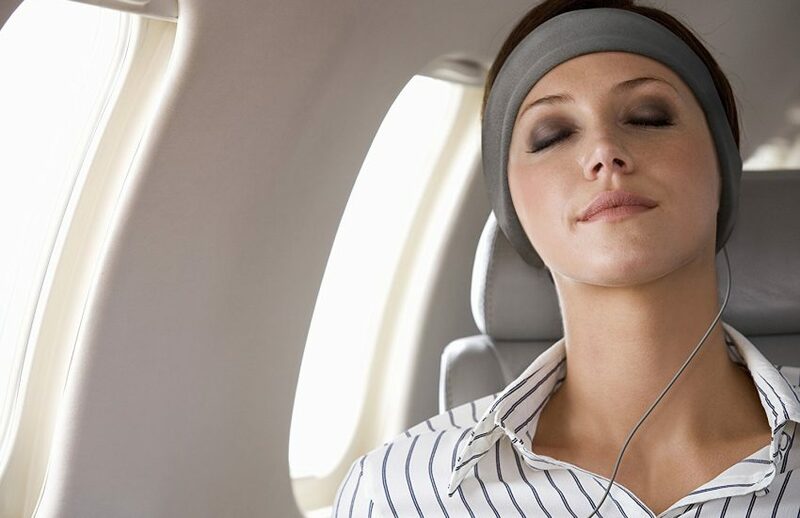 Therefore, depending on your tastes and preferences, you can choose whether you want to wear fabric headphones, some of the most comfortable earbuds, full-size headphones with active noise cancelling technology, or special noise generators in order to make your sleeping atmosphere more pleasant and calming. Headphones made specially for sleeping are different from ordinary headphones and you can recognize them by a piece of cloth that covers small flat speakers. The cloth is wrapped around your head providing more stability and more comfort, especially for side sleepers. It is usually shaped like a headband with speakers inserted at the places where your ears are supposed to be. Some models look more like a mask than a headband because they also cover your eyes in order to provide more comfort and sleeping atmosphere for people who have more serious problems and can’t stand unpleasant sounds or too much light. They might not be the most attractive headphones in the world but if you prefer complete darkness in your bedroom, you should check some of the models on our list of 7 best noise cancelling headphones for sleeping. Things You Should Consider Before Buying Headphones for Sleeping? Most of the sleeping headphones aren’t expensive and our list of 7 best noise cancelling headphones for sleeping proves it. You can find different models made like a headband, sleeping mask or even caps made for cold days. However, if you decide to buy a wireless model of sleeping headphones or some good ANC earbuds or over-ear headphones, it might cost you a decent amount of money, but if something helps you, it really doesn’t matter how much it costs – it is better to sacrifice money than health. Comfort is probably even more important than the durability or sound quality of products like headphones, especially when you use them for so many hours. Fabric sleeping headphones should be one of the most comfortable headphones on the market; they are certainly more comfortable than full-size headphones. They enable you to sleep in any position you want without speakers putting too much pressure on your ears or your head. However, some people don’t like the idea of headband keeping their head warm, but it is all up to one’s taste and personal feeling. 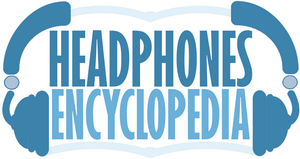 As you probably already know, there are two types of noise cancellation – passive and active. Most of the headphones have passive noise cancellation technology, which is also called noise isolation and it refers to physical noise isolation. For example, if you put earbuds in your ear canal, their ear tips will seal your ear canal physically and they will prevent unwanted sounds from entering your ear. Something similar happens when you put on over-ear headphones because the pads surround your ears and insulate great amount of ambient noise. Sleeping headphones also have this type of noise cancellation. It might sometimes be a bit weaker than the active noise cancellation on earbuds or full-size headphones, but it helps you isolate yourself from a noisy environment. Active noise cancellation technology refers to microphone picking up ambient noise and creating opposite sound waves in the earpieces so that you hear nothing besides your favorite music. Sleeping headphones are mostly wired and although the speakers are extremely thin and the headband preserves stability and increases the level of comfort, the audio cable is always one of the greatest problems with headphones, especially if you sleep with them. Many people are afraid that the cable will wrap around their neck during the night and choke them. Although this fear feels a bit unreasonable and exaggerated, there is one real problem and it concerns the device your headphones are connected to. If you toss and turn during sleep, you will pull your phone/player on the ground because you pull the device along with the cable. The device can fall down and break and you certainly don’t want unplanned costs. That’s the reason why wireless sleeping headphones are invented, so if you have some of the previously mentioned fears, you better choose some of the wireless models, which have long-lasting batteries (more than 6 hours on average). CozyPhones definitely aren’t the best-looking headphones in the world nor they sound amazing and the manufacturer doesn’t hide that fact. These were made to be worn in bed or during some physical activities like jogging and they are meant for people who find most of other headphones uncomfortable. Their main purpose is to provide extra comfort, mostly for sleeping, and satisfying sound quality. CozyPhones have interesting design. 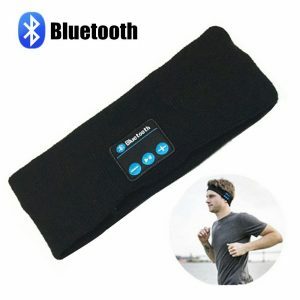 They consist of the headband that is available in four different colors (black, white, pink and blue) and very thin round speakers that are covered with fabric and inserted into the headband. After insertion, you will have to adjust the position of the speakers to lay nicely on your ears without hurting them. The speakers are connected with Y-shaped 1.5m long audio cable, which ends with universal 3.5mm straight connector. These headphones come in a simple packaging that contains only headphones, travel bag and 100% money back guarantee. Cozy Phones are mostly made from very comfortable and durable materials, such as lycra, which is the most common material in sportswear industry. It fits closely to your skin, but it is stretchy and it can fit any head size. The only problem that was reported are stains on pillows that the headband leaves, so it is advisable to wash the headband according to the instructions in the manual. There are also some problems with braided audio cable, which is not very durable. Although the manufacturer claims that it doesn’t break or tangle, it actually does, so be very careful when using it. As far as comfort is concerned, these headphones are one of the most comfortable headphones on the market. Comfort has different meaning for every one of us, but we would all probably agree that it is easier to sleep with these headphones than some earbuds or full-size headphones, no matter how comfortable they are. CozyPhones weigh almost nothing (0.3 ounces) and you will hardly feel them on your head. They don’t put pressure on your ears or the rest of your head, but they are very stable and no matter what you are doing or how much you are tossing and turning in your bed, they won’t move much. That’s the reason why these are great for working out and jogging. When it comes to sound quality, we must admit that CozyPhones offer only average sound. We can’t even speak about distinctive bass, highs, mids, and lows because they are all barely average and the sound quality was sacrificed to provide better comfort, but you will definitely be satisfied, as you don’t need the best-sounding headphones for bed. Bear in mind that their passive noise cancellation is also average, so if you have very sensitive hearing, you better use some ear plugs under the headphones. Tooks Sportec Band is one more model of sleeping headphones that actually represents a headband with removable headphones (speakers). This model can be used not only for sleeping but also for working out, jogging or walking. You can also wear it under your cap during cold winter days. Sportec Band Headphones have simple design and they are available in three different colors (white, black and pink). 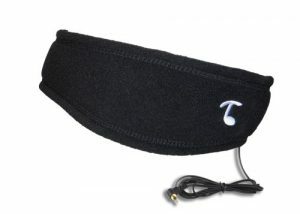 The headband is available only in one size, which sometimes causes problems for users with a bit bigger or a bit smaller heads. 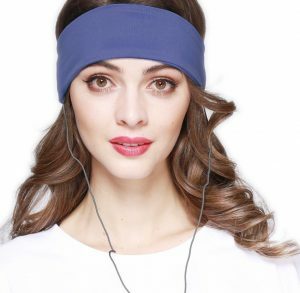 The speakers are inserted through a hole on the inside of the headband and their position is fully adjustable as they don’t have fixed position. These headphones have 56-inch long audio cable, which goes behind your head and ends with universal L-shaped 3.5mm connector. These headphones come in a rather poor package, which contains only the headband and speakers. Tooks Sportec Band are quite durable headphones. 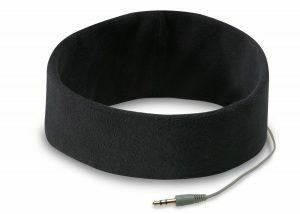 The headband is made from washable microfleece and the speakers are made from plastic. The audio cable is rubberized, tangle-resistant and more durable than the CozyPhones audio cable. Customers have different opinions about comfort. Most of the users confirm that these headphones are very comfortable, but there are also some complaints about too tight headband and too sturdy speakers. On the one side, the problem is the size of the headband that is universal, although head sizes aren’t and it is often necessary to adjust it with safety pins or intentional stretching in order to lose it a bit. On the other side, although the speakers are quite small, they are made from too sturdy plastic that some people find uncomfortable and they say that the speakers hurt their ears when they sleep on a side. Also, the speakers aren’t so flat. On the outer side, you can find some kind of a bump that can cause problems and pain if your pillow isn’t soft enough. However, these headphones are more comfortable than most of other models, they are very stable and quite light (118 g) and they don’t heat your head and ears too much. Sound quality isn’t remarkable, but we can say that it is better than expected considering the price. They provide a certain amount of passive noise cancellation, so they will isolate some noise, but if you have hypersensitive hearing, we recommend wearing ear plugs under the headband and speakers. The third product we decided to present to you are wired and wireless versions of AcousticSheep SleepPhones because they have the same design, the same build, and sound quality, and the only difference is the type of connection. AcousticSheep SleepPhones consist of a headband and speakers inside it. The only difference is that wired model has 48-inch long audio cable that ends with straight universal 3.5mm connector, which is compatible with most of the modern portable devices. The wireless model doesn’t have that cable, as the speakers are connected with short cables and Bluetooth rechargeable module that stay under the headband. The module contains the battery that can last for up to 13h on low volume and it takes at most 3 hours to recharge. It also has three buttons that help you power on/off the headphones and control the volume. When charging, one small indicator on the module shines red and it turns off when the battery is fully charged. The design of these sleeping headphones allows you to take those thin speakers out and wash the headband, which can also be used as eye mask. The headband is available in 5 colors (blue, black, lavender, grey, and pink) and 3 sizes (XS, XL and medium size which fits most people). AcousticSheep SleepPhones come alone in both wireless and wired versions. These headphones are advertised as very durable, but we advise you to be careful and don’t expose them to severe usage. The headband is available in two versions; one made from soft fleece and the second from polyester, so you can choose one depending on the climate in your town or the conditions you will be wearing the headphones in. The cables are covered with fabric and they are really thin so they don’t seem very durable. The speakers are really thin and protected by soft fleece on both sides. Because of the cable and speakers built, we advise you to take them out carefully when you want to adjust the position of the speakers or just to wash the headband because they can be damaged when pulled out through the small hole on the headband. The Bluetooth module is made from soft bendable material, which won’t hurt your head while wearing headphones. When it comes to comfort, these headphones are very soft and comfortable and they will definitely lay nicely on your ears and hurt them less than other models of sleeping headphones, but there were complaints regarding the headband size and the speaker repositioning during sleeping. Because of that, we advise you to check the advertised dimensions of the headbands and make sure you choose the right size so that it stands nicely and comfortably on your head without putting any pressure or being too loose. The speakers’ position can be adjusted, but don’t expect them to stay in that very position during the whole night, especially if you move a lot in bed. The wired version is far less comfortable because the audio cable can cause you some problems no matter how long it is, so the Bluetooth version is far better, although it is unreasonably expensive for a pair of sleeping headphones. AcousticSheep SleepPhones don’t offer supreme sound, but they do leave the impression of stereo sound. It is not perfectly clear, but it really doesn’t matter because these headphones are primarily made for sleeping and listening to relaxing music or audio books at low volumes. However, you won’t be disappointed if you wear these while working out or doing chores because the sound quality isn’t worse than the sound of average pair of earbuds or cheaper headphones but be aware that Bluetooth range is 30 feet at its best. These headphones have passive noise cancellation so they can isolate a certain amount of noise, but don’t expect them to completely isolate noises such as barking or extremely loud snoring. The next product on our list is 2 in 1 product made by Hibermate. 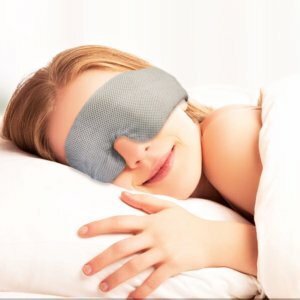 They combined sleeping mask and sleep headphones in one product in order to provide maximum comfort for people who have trouble falling asleep. Hibermate Sleep Headphones don’t have too appealing design and they come only in black color, but as the manufacturer was focused on functionality, we can’t really resent him. These headphones follow the shape of human face and the front part of the product that represents sleeping mask has eye dents and a cut out for your nose. 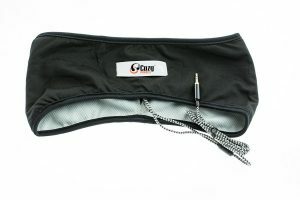 On the sides, there are soft and thick ear cushions where the removable speakers are inserted and on the back is the strap that can be adjusted to the size of your head. However, in some cases if your head is bigger than average, it might be difficult to adjust the mask because the front part is universal and the speakers can’t be repositioned, so the mask might not cover nicely all the necessary parts of your face. These headphones are also wired and the cable is only 3.3 feet long, which might be too short for many people, especially when you are sleeping and you don’t want to accidentally pull your phone down to floor. The cable ends with 3.5 mm gold-plated connector, which is compatible with most of the modern devices. There is also mic and remote controls on the cable, which enable you to control the volume, play/pause audio or answer calls without using phone. These headphones come in a nice package without any additional parts, except for an airplane adapter. The mask, the speakers, and the cable are made from quality and durable materials. 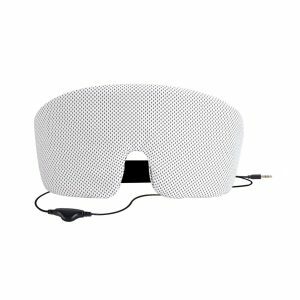 The mask is thick and prevents light from destroying your sleep and the ear cushions are made from memory foam, which provides extra softness for your ears. The product is basically lightweight, but 8 ounces on face might not be the first choice for everybody. The speakers are 5mm thin and although they aren’t too thick or edgy, they are made from plastic, which might hurt your ears if they are extremely sensitive. It is advertised that the audio cable is coated with Kevlar, just like Apple cables are. That should provide extra durability and ensure that the cable is tangle free, but there were some complaints about cable breaking anyway. When it comes to sound quality, these headphones have a lot to offer for a pair of sleeping headphones. They have decent lows, mids, and highs, they can be very loud if you need loudness, and they offer clear sound, especially vocals, so you can listen to anything from white noise, audio books, or music. There’s also an app you can download (Relax Melodies from Apple App Store) and there you can find storm soundtracks that can help you shut out loud snoring, although the passive noise isolation they already have because of the thick ear cushions is extremely good. Firik Sleep Headphones are perfect choice for people who don’t have or don’t want to spend great amount of money on headphones for sleeping. They are available in different prints and different colors. For adults, there are black, blue, pink or multicolor versions, but there are also differently shaped headphones for kids that can be used when traveling long hours with small children. These headphones consist of a headband and very thin rounded speakers that can be removed when you want to wash the headband or they can be repositioned in order to provide better fit to your ears. The headband is quite wide and you can cover your eyes with it and use it as sleeping mask because it blocks light nicely. The headphones are wired and the cable has inline mic and remote controls, which is great in case you want to make calls or change volume settings without using your phone. The cable ends with 3.5mm straight gold-plated connector, which is compatible with all phones, players, etc. These headphones come in a nice metal box without any accessories except for the headband and speakers. Firik Sleep Headphones are made from relatively durable materials. The headband is made from lycra, although there are versions made from some kind of fleece or some other soft material, which is not recommendable if you don’t want your head to be heated. Lycra is also better for outdoor activities, such as jogging. One of the things you should pay attention to is washing the headband because it is advisable to hand-wash it. Also, the headband tends to stain your pillow so it is recommended to soak it in vinegar before use. The audio cable is usually braided, which means that it is less durable than rubber ones and that it is also more prone to tangling, but there are some versions of these headphones that have flat rubberized cable, which should be more durable. As far as comfort is concerned, Firik Sleep Headphones are really comfortable. The headband is thin as well as the speakers. However, comfort is subjective feeling and it varies from person to person. People have differently shaped heads and some of them have more sensitive ears than others. The headband size is universal, so it might be too small or too big for some people. Some of the users have found the speakers too uncomfortable because they move during the night and they hurt their ears. Firik Sleep Headphones have decent sound quality for this type of headphones and the price range. They block decent amount of ambient noise, but they do leak decent amount of sound as well. The sound is clear and pleasant. It won’t be the first choice for an audiophile, but it is good enough for listening to audio books or some relaxing music. LC-dolida Music Headband Headphones are product that can be used in many different everyday situations. The company produces not only music headbands but also music caps that are so warm you can use them while skiing. 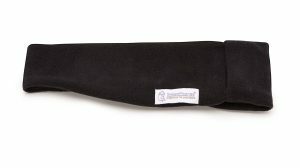 The headband we have chosen to use is great for activities such as working out, walking or traveling, but also for sleeping because the headband can be used as an eye mask that can help you fall asleep faster. These headphones have simple design and they are available in two colors (grey and black). They are made in one size that is supposed to fit most people, so it is possible that it won’t fit people with bigger heads and ears. Two speakers are on the sides of the headband and the Bluetooth module is on the back, so when you remove the module, you can wash the headband. These headphones are wireless. They use Bluetooth 4.1 technology, the battery takes 2 hours to fully recharge and although it is advertised that it can last for 5 hours straight, customers say that they use the headphones for 6 to 8 hours, which should be enough for most people to get some quality sleep. The speakers aren’t removable, which can be a problem because they can’t be repositioned in case their position doesn’t match your ear position, but they are quite soft so they won’t hurt your ears while sleeping, and they won’t move when you turn in bed. LC-dolida Bluetooth Headphones come in a simple packaging with one USB charging cable and user manual that instructs you how to use the product and maintain it. The headband of these headphones is made from special material, a combination of nylon and cotton. That material is highly absorbing and that’s the reason why they are great for working out as they absorb annoying sweat falling from your forehead. When it comes to sound quality, many customers were surprised with the quality of sound that this music headband or cap can offer. The sound is quite clear and it can also be pretty loud, so they are great option for listening to music, audio books, etc. Passive noise isolation is also quite good and you can be sure that these headphones will isolate great amount of ambient noise. In addition, you will be able to move freely in bed without worrying about cables and phones, because they are wireless and the range is 33 feet, which is more than enough for sleeping. 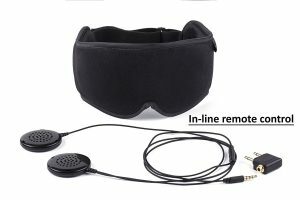 Agptek Sleep Headphones are actually an eye mask and headphones in one product. It has the eye mask shape and the speakers are on the sides of the band. These headphones are available in black and silver colors and they are quite thick (0.78 inches). That means that they block disturbing light, but they also keep a lot of heat. The mask also has removable speakers and it can be washed. The speakers’ position is fully adjustable, so you won’t have problems with that, but some people find them uncomfortable in spite of the mask’s thickness. On the backside of the band, there is an adhesive tape (Velcro) that is used to adjust the size of the band to the size of your head. Some customers say that the size of the mask is too big and it slides down during the night, while others have problems with long hair tangling around the Velcro. These headphones are wired and the audio cable is connected to the right side of the mask (the right speaker). It is 5 feet long, it has inline volume controls and it ends with 3.5 mm straight connector that can be used with multiple devices. Agptek Sleep Headphones come in a simple packaging with user manual and textile carrying bag. These headphones are relatively durable. The mask is made from cold-skin fabric and it has removable sponge so that the mask can be easily cleaned. Besides problems related with adjusting the size, customers didn’t have problems with mask durability, but in our opinion, you should carefully use the cable, as it is braided and prone to tangling and breaking. Agptek Sleep Headphones are definitely one of the most comfortable products for sleeping currently available on the market, but when it comes to sound quality, there were some complaints about the loudness of the headphones. It is the fact that, because of the mask thickness, these headphones block great amount of ambient noise. Also, the sound is quite clear and pleasant, but the headphones seem to be too quiet for some people. However, sleep headphones aren’t really meant to be very loud, so we can’t resent the manufacturer really hard. Every single thing in this world has its benefits and downsides. It is the same with headphones. Nobody can’t deny that they are extremely useful in many aspects, but we have to admit that wearing them while sleeping could have some side effects and could cause some health problems. We can’t call this the real problem because it is kind of impossible for so thin audio cable to choke you without you realizing it, but it is certainly one of the most common fears that people who sleep with headphones have. The only solution in these situations would be to avoid wired headphones in bed and focus only on Bluetooth models. They will offer you possibility to move freely in your bed without fear that you will damage your phone or headphones. Also, they have quite good and stable Bluetooth connection, so you shouldn’t have problems with sound quality or connection loss. The only thing that might be unpleasant is the price, which is often much higher for wireless than wired models. However, if you feel so much relaxed wearing wireless models, it is worth the price. One of the real health problems that can appear with regular and especially extended headphone use are hearing problems that usually start with Tinnitus, which is another name for buzzing in ears caused by listening to too loud audio content. When people wear headphones during the day, for traveling or while working, they can take them off from time to time and enable their ears to have a break. On the other side, when you wear headphones while sleeping, you can’t really consciously take a break, so one of the things you can do to preserve your health is to take care of the loudness. That can be a problem if your headphones don’t have ANC, so make sure that you buy headphones with good passive noise cancellation if you can’t stand ambient noise at all. Wearing headphones of any kind prevents ears and skin from breathing, so don’t be surprised if some kind of infection shows up. The most common problems that can appear are excessive ear wax build-up and ear canal infections. Headphones block the entrance to the ear canal, and because of that, there is no air circulation which causes ear wax to build up. That way, it is stored near the ear drums, which is very deep and it is very difficult to clean it without medical assistance. Ear canal infections appear when headphones stay long in your ears/ear canals and the skin around headphones/earbuds gets irritated and sore. You can prevent this by taking the headphones off from time to time to help ears breathe and rest. These types of problems are mostly caused by earbuds because they are inserted deep into ear canal, but we advise you to be equally careful when using other types of headphones because any of them can cause similar problems if not used properly. Headphones are our best friend when walking through noisy streets or commuting. Headphones will help you block unpleasant engine noise and the chatter you would hear without them, they will help you relax and avoid unnecessary stress. Even when you work in crowded office and you don’t want to hear everything your colleagues have to say, it is great to put your headphones on and isolate yourself so you can concentrate on your work. As we have already said, headphones can help you fall asleep easier and faster, in spite of noisy neighborhood or snoring partner/roommate. You only have to find the model of headphones that suits you best and find the right audio content. Some people prefer music, while others listen to some reading or simply play white noise. There are really no rules, it is all up to you and when you find the right audio content and the right headphones, they will do the rest so you can sleep tightly. Learning is actually similar to sleeping. Every person has his own habits. By using headphones, you can stop other people from distracting you and asking different questions, you can listen to anything you want even in a library. In any case, headphones will help you concentrate on your work and achieve better results. In conclusion, we have to say that, as you could see, headphones have their good and bad sides. The most important thing about using headphones in any situation, as well as sleeping, is to use them correctly and in the way that doesn’t endanger your health. If you do so, you will realize how helpful they can be. So, if you have sleeping problems and you can’t find a way to solve it, scroll up and take a look at our list of 7 best noise cancelling headphones for sleeping in 2019. We assure you that you will find some good choices. This is really a nice informative content and easy to read. I love this post and I choose to AGPTEK Sleep Earbuds, Ultra-Soft Silicone Noise Isolating Headphones for my own. After seeing this I ask my friend that, he used it or something know about the headphones? How is the sound quality? It will not broke after 1 or 2 month. Please can you inform me about this earbuds sound quality? Thank you.